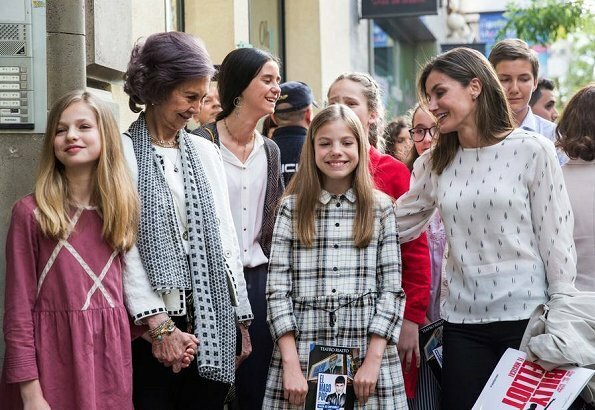 On May 19, 2018, Queen Letizia, Queen Sofia, Princess Leonor, Infanta Sofia, Victoria Federica Marichalar and Irene Urdangarin watched Billy Elliot's musical theater play performed at Madrid Nuevo Teatro Alcalá. The musical composed by Elton John is Billy Elliot's adaptation to theater and tells the story of Billy who took boxing course to please his father, however soon afterwards discovered that his real passion is dancing. I so dislike how Sofia constantly grasps the hands of the girls in firm grip. This is so overstepping personal boundaries. Give these girls some space, they are not kids anymore, they are teenagers, otherwise the royal family will have to expect signs of rebellion, when the girls grow older. It looks unhealthy to me. I've already noticed the signs and it bothers me, too. I don't remember which of the girls did it, but in the video that went viral of Queen Letizia walking in front of Sofia one of the girls pulled her hand away. With all due respect, I would have done the same thing. My bad. She was not holding their hands, but she had her arms around (I thought rather snugly) both girls. I believe it was Infanta Sofia who reached up and pushed her arm away. The Queen had already tried to do the same thing and I wonder if the was the reason for the problems and not that the former Queen wanted to have a photo with her granddaughters. I completely agree with you. I think this is what caused the unpleasant scene at the Cathedral. 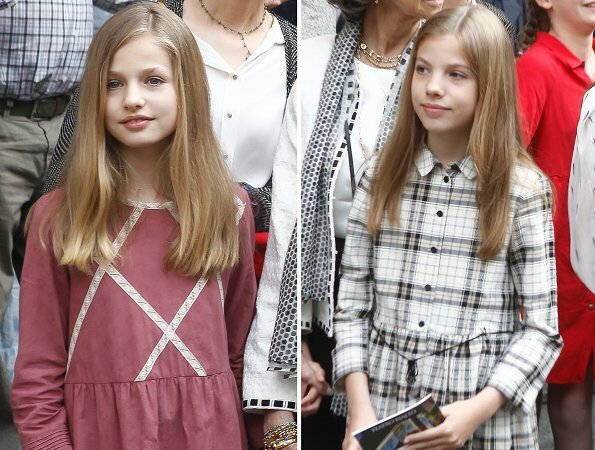 It always looks as if Sofia was staking her claim to the girls in front of the press (particularly to Leonor) and it irks both the girls and Letizia, who ends up being sidelined. It makes everyone look uncomfortable. Love the younger Sofia's dress. Leonor is wearing a dress previously worn by her sister. My impression too. "Overstepping personal boundaries" - that is what Sofia does. Leonor et Sofie me laissaient sans un mot. Beauté, purement et simplement. It´s time to stop putting these soon-to-be-teenagers in little girl dresses. I´m not suggesting to dress them like women, but there are wonderful age-appropriate items they could wear that have more structure to them than these shapeless dresses. 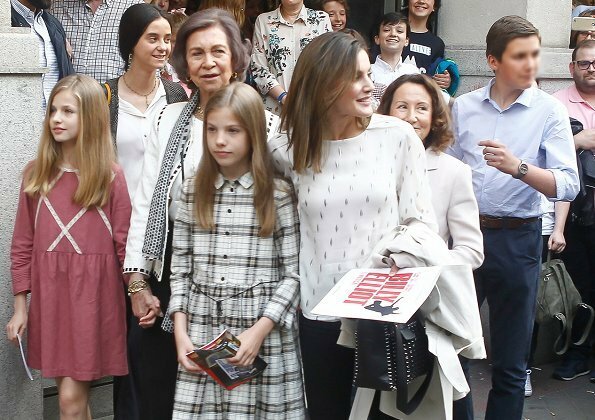 I like QSofia´s outfit, and Letizia´s blouse. Very flattering. I agree with all that you said. I think the Belgian royal kids are a good example of age appropriate clothes. Not like little women, but like preteens and teens. Agreed, the Danish royal children dress like regular kids too (except for special events). Personally, I think kids should be allowed to express their individuality in their clothing or later on they will rebel, often in a more permanent way. When will these kids finally be allowed to dress as teenagers? I agree with Beth about Sofia's firm grip, that's another sign these kids are not considered as teens. Surely when they are truly teenagers. Leonor is twelve years old and Sofía just turned eleven less tan a month ago. The dresses they wear come in sizes up to fourteen years old and are perfectly adequate to their ages. Yes, the girls are always dressed like little girls and they treat them like little girls. That is strange to see. It seems like the Spanish royal family doesn't want to let them develop to adult women. This is Spain and another more affectionate culture. It's not unusual at all to hold hands with your kids up til this age. And when in near of paparazzi I would definitly do to. But I agree it's time to dress them more teenage-like..
Time flies. They are not teenagers yet. Soon they will be choosing their own clothes. Note that QEII did not come out of the church to pose with her grandson even though no one would have told her no. I agree the girls are still being dressed like they are 6 and 7 years old. Spaniards are very prone to hugging, kissing and to not need as much " personal space" as other cultures. When it comes to grandmothers, they are unstoppable:-) Queen Letizia herself is very criticized by her detractors, due to the amount of touching in public appearances, personally I don't think it's a big deal, there will come the day when the kids will run away from all that babyish affection. I also find the girls appropriately dressed for their ages, obviously the dresses come up to size 12 at a minimum, so it can't be that unusual. I am sure that soon enough they will be choosing more nature outfits. All of them look great and happy, nice all girl outing. Today's photo up is a nice grouping of Royal children. Lenors dress is a bit like she slept in it,also need to agree with other Posters,their dresses are like they are 7 years old.Why Letizia want them to stay like little kid's no one knows, maybe she fears they will outshine her?. My granny also tends to grap my amts and such like im a child or something. What doesn't excuse letizias behavior. Let her be and then talk to her in private. She just loves the girls. I don't see her being that bad in public anyways. She is just holding Leonor hand and not even Sofias. Did you notice that Paloma Rocasolano is behind her daughter, giving the other grandmother all space to shine? Did you notice that Paloma Rocasolano is behind her daughter giving all the space to the royal grandmother? Also holding hands is very QSofia-like, during the wedding of Felipe and Letizia, QSofia is she is holding Felipe's hand. Queen Sofia is their 80 years old 'Granny'(!) - and I can't see anything wrong in holding hands, when they are walking 'outdoors', I didn't see it as a protecting, but as love. Prins Henrik did it all the time with his grandchildren, and as far as I remember Victoria and Madeleine (as grown-up) did it also with their aunt, Princess Lilian, when she was old and fragile, same age as Queen Sophia !! But if their mother doesn't like it, just like you, perhaps the girls find it unnatural, too ? Marie-Chantal overreacted, but in a way , I understand her! Beautiful family and nothing wrong if granny wants to hold the hand of her granddaughter. It shows love and affection. Granny is affectionate to be sure, but it is always the same child who is grabbed, hugged, kissed etc. in public at every event. ..look at family group pictures, again the same child. One of the others lives in another country, a little love for her please. Wat een ongelofelijk zeldzaam gezeur. Handen af van Sofia van Spanje, Prinses van Griekenland. 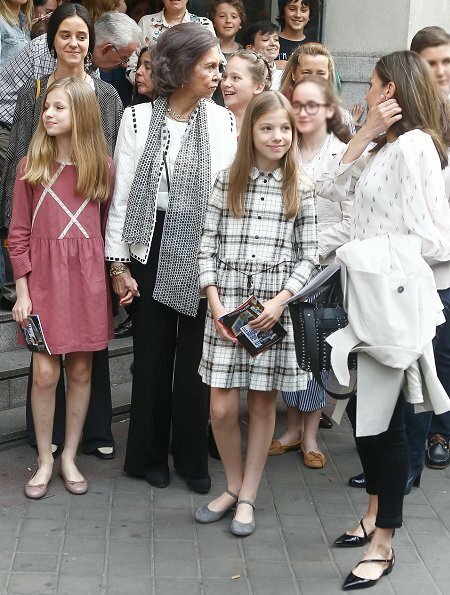 It is a shame that Queen Sofia seems to have become so imposing over her grand-daughters. Letizia and Queen Sofia always seemed to enjoy a very good relationship, a very friendly relationship. 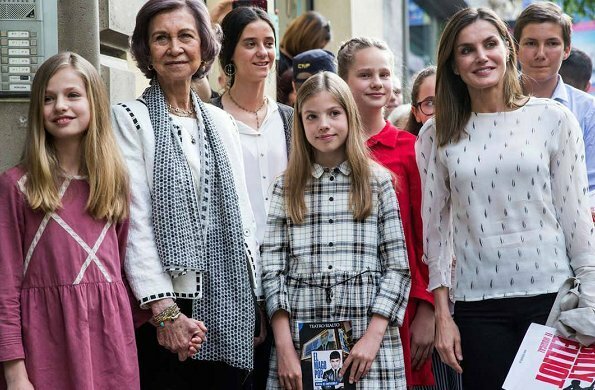 The more Queen Sofia tries to manage her grand-daughters the more they will resist and the more Letizia may grow to resent what she perceives as "interference".